Victoria Wong: "Getting Movable Type where I wanted it turned out to be much more of a project than I expected. 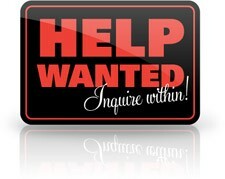 I've documented the following in hopes that it'll help someone out there." - This is going to be invaluable as I move forward with my Movable Type 5 experiment. As of this writing Movable Type is the front-runner in my weblogging tool search. Rob Wells: "Tumblr isn't a bad system. It's really not. It's fantastic. But it's just not what I'm looking for for my main site. I've still got it set up and I'm still going to post things to it, but 'proper' blog posts that have taken time and effort will be published here." - A view from a switcher. This particular Rob went from WordPress to Tumblr back to WordPress. My research into weblogging systems continues. I've been experimenting with Movable Type a bit, along with Tumblr, and of course I'm continuing to use Blogger to post. I hope to put together an official review of the systems I'm evaluating in the near future. To be perfectly honest I'd love to move to WordPress but it misses the one feature I find most important; static publishing. If it wasn't for that I'd have leapt to it a while back. So, we're down to three systems as of today. Movable Type, Tumblr, and Blogger. P.S. - I am well aware of WordPress caching systems. Thanks. When I started my development career back in 1988 one of the best pieces of advice I've ever received came from a very small indie shop called Burton Systems Software. His advice was simple, "I don't care whose version control system you use, but you NEED to use one." Dave Burton, the proprietor of Burton Systems, makes his living writing a version control system called TLIB. Needless to say, we purchased TLIB, and the rest is history. Look, if you're doing any type of development; web, desktop, or whatever, and it's text based and constantly changing, you NEED to use a version control system. There are plenty on the market. Everything from free to paid, and they all have their plusses and minuses. For my "money" I like Subversion, commonly referred to as SVN. The cool kids are using distributed version control systems, like Git, Mercurial and Bazarr, but in the end they're just another version control system. My take on Git is this, it's good if you're working with an open source project and exchanging patches, or working disconnected with your laptop. Beyond that I just don't see much advantage in these over existing systems. But, please feel free to leave comments, educate me. Where do I keep this stuff? Putting your work in the cloud. Ooooohhh, the buzzword of the year. Yes, you can of course keep this stuff wherever you'd like. A lot of companies with their own servers keep their source repositories on the corporate network. There are other options of course. If you have someone hosting your domain chances are they have Subversion support, and if you don't mind wearing an administrator hat they're quite easy to manage. The ultimate choice, of course, is to use a company that takes care of your repositories. If you have an open source project you can keep your code at Google, that's nice, and free. If you have a commercial product and don't mind spending a few bucks you can host your code on services like Beanstalk for Subversion repositories, or give GitHub a try if you're using Git. Both Beanstalk and Git have a nice pricing structure, that include free repositories with some restrictions. Version control is another one of those religious things in software development, so go compare the features, find one that works for you and use it. There's nothing worse than having a hard drive fail and seeing all your work disappear. Like many I use Twitter and Facebook, and I have my weblog, which I consider the center point of the Rob Fahrni Network. Dave Winer has been working to de-centralize micro blogging, that's not a bad thing, it's a very good thing. I like the idea of being in charge of my very own nightmare. I need a center point, a launch pad, that works with all these services, including my weblog, and pushes updates to Twitter, Facebook, my weblog, and the other services that are a part of the Rob Fahrni Network. Well, I see my weblog as a personal history of my adventures in life. Apparently it's next to impossible to get your full Twitter history, Dave has done so by constantly backing it up. I'd like to do so moving forward. To do that I'll need a tool I can use for weblogging as well as one for microblogging that will push to Twitter and Facebook, as well as keeping a copy of everything for myself. That is the question. I have server space and I'd like for it to live there. I have a desktop tool I love, MarsEdit from Red Sweater Software, but it's just a way to push data to the server. So, are there existing web services I could use to tie it all together? There's Ping.fm which offers a gateway to many different services, including Twitter, Facebook, Blogger, and Flickr, just to name a few. There's FriendFeed which will aggregate posts from your weblog, or Twitter, or Facebook, and publish to other services. I'd like to find a CMS, or weblogging tool like WordPress, that I can use as the center of the Rob Fahrni Network. Here's what I'm after. 1) It must install on my server. 2) It needs a UI to publish directly to social networks, ala Ping.fm. 3) It needs a weblogging UI, that in turn pushes the title and shortened link to social networks. 4) It needs to publish to my weblog and publish to a microblog, ala Twitter, that's lives in my network. 5) It must have API's. One for blogging, one for microblogging, so I can point my favorite desktop at it. Basically MarsEdit would become my frontend to tweeting. 5) Everything points back to a center point, my weblog. Instead of going to Twitter, or Facebook, or Blogger, I go to my network, where everything begins life, and it pushes to other services. For your average person this is Facebook, I want more, I want to control it. It is, after all, my content. Hopefully I'll be able to do this with a combination of WordPress and Ping.fm. If not, maybe someone has already explored this and has a nice solution. I purchased a new domain a while back with the intent of creating my own URL shortening service. I'm writing this now because I just noticed an entry, from Mr. Bob Kepford, on Twitter about setting up his own. It reminded me, I need to get this show on the road. But what should I use? I've decided to go with Adjix. They have a very simple setup for creating your own custom shortening service by using Amazon S3 as the storage mechanism and they simply redirect from your URL, through Adjix, and off to the desired URL. Pretty sweet! So, what do you need? Simple, Adjix has a weblog post to explain the entire thing. After you've read it, and configured your own service, read the next entry to complete the full setup. Dave Winer, A.K.A. Dr. Bootstrap, was one of the first to do this, and it's working quite well for him. Dave's own custom label shortening service, r2.ly, has been online and working for a while now. I will be applying this to my own, white label, URL shortening service, soon, I hope. Emilio Cavazos: "Thanks to plugins, I was able to extend MacVim with most of the features that make TextMate such an amazing editor. I was also pleased that it looked like a mac app and not some hideous Linux port." - Your mileage may vary. At least the Linux crazies enthusiasts will have a familiar experience if they switch to the Mac. Having said that, this could be a great tool for the folks. Personally I'd probably choose BareBones BBEdit, but FREE is often good enough for most people. For my HTML and CSS needs, which are pretty minor, I've been using Espresso and love it. There's also the very popular Coda from the fine folks at Panic. For day-to-day development on the Mac it's hard to beat XCode. Louis Gerbarg: "On my iPhone 3G it runs really choppy, on my 3GS it runs acceptably, but it still isn't smooth. Given the OpenGL performance people have seen on the 3GS that is still pretty bad. I have not done any invasive tests by instrumenting the binary, that is just what I can get via basic usage. The sad thing is that there is no reason it has to have performance like this." - I'm sure we'll see it get better, but, since it is OpenGl it's going to chew on battery. I wouldn't use this for real applications, but it could be a great choice for games. Especially those "one off" games for movie and product promotions. Mini-Microsoft: "Did he talk about how we're losing the edge on client development for Windows and how it's all a confused multi-SDK technology mess centered around everything being .NET based?" - Interesting take. When your own devs say your SDK offerings are a mess, well, that's a problem. As for .NET, it makes developing applications a whole heckuva lot easier. The runtime plus framework are brilliant; pick your favorite language and get busy, C#, VB.Net, Iron Ruby, Iron Python, [insert your favorite here.] Some would say "Hey, that's too confusing." Not really. Everything being equal from the runtime and frameworks perspective is really nice. They have great tools; UI creation is way easier in Windows than on the Mac, at least it is for me. All that said, I'd rather spend my days writing Mac, or iPhone, software and beat my head against the Interface Builder wall than spend another day writing Windows applications. Maybe someday I'll have that opportunity. For now, Windows, and to a lesser degree Linux, pays the bills. It's strange. Not that long ago I'd have considered working for Microsoft again, maybe. Now, now I don't think I'd consider it, unless it was on a pure Mac, or iPhone, application. Mobile Orchard: "Some memory leaks are easy to see by looking at your code. Some are much more difficult. This is where Instruments comes in. Instruments has a 'Leaks' tool that will tell you exactly where you're leaking memory so that you can get in there and fix it!" - These are the types of tools every developer should learn. Hard as we try to write clean code we will, on occasion, forget to release a reference to an object and you get the dreaded memory leak. I must admit the Cocoa reference counting mechanism is a bit odd to an "old-school" Windows/COM developer, but I've learned to deal with the oddness. Oh, there is a great tutorial for Windows COM guys to explore if they're coming over to Objective-C/Cocoa to help with the ref counting mechanism. Delphi on Mac OS X? Allen Bauer: "I guess the proverbial cat is now out of the bag. As was shown in the Delphi/C++Builder roadmap at Delphi Live!, Project X has been under way for a while now. So now you know some of the reason why things have been rather quiet here since I could not really talk about what I'm working on. The good news is that we now have a returning top-shelf engineer working on the compiler. This person was heavily involved with the original Delphi on Linux project, so there is a lot of institutional knowledge that he's able to bring to the table." - I have a lurking interest in Delphi. The guys at Embarcadero, formerly CodeGear, formerly Borland, create great IDE's and developer tools. Here's hoping the embrace the Macintosh way and make it impossible for someone to tell an Objective-C/Cocoa application from a Delphi Mac OS X application. The good thing is it opens the doors to more developers, the bad thing is is opens the doors to more developers. If developers coming from Windows bring all their Windows baggage along with them we'll get some pretty crummy Mac applications. If they embrace what the Mac development community has know all along they should do just fine. What is it Mac developers do differently? They create elegant, useful, stable, simple, to-the-point, software. You see it time and again on the Macintosh and I've come to appreciate it. The application I use to post to this weblog is a prime example, MarsEdit is something I use everyday, and it fits all those qualities I've listed above. Most Windows applications have noisy UI's, just look at Microsoft Word, and you'll see what I'm talking about. So, Embarcadero, please, please pay attention to the toolbox and make sure everything you do looks like belongs on the Macintosh! I've been working on my iPhone application again, it's been months, and I've been making good progress. Cocoa Touch and Objective-C are beginning to slowly sink into my thick skull, which is a very good thing. I have a bunch of experiences to share and I really need to sit down and write them up, with hopes is helps another poor Win32/C++/COM guy make the leap into Cocoa/Objective-C land. What are some of the things I hope to talk about? Glad you asked. The application I'm working on is very table oriented. It's really about data collection, so I've formed some very good patterns for dealing with it. Another thing I'd like to address is my view of reference counting with Cocoa, from a COM developers perspective. I'd also like to dive into is comparing Win32/C++/COM to Objective-C/Cocoa to .NET/C#/pick a language. I think Apple used to have a leg up with Objective-C/Cocoa, now I honestly believe .NET may have the edge in the rapid development department. Hopefully I'll get around to writing about it some day, but you never know, this tease may be the final word. As of this writing it's still my goal to become a full time Objective-C/Cocoa/Mac/iPhone developer, that's how much I'm enjoying the experience. Rendering on top of Adobe AIR? I have a question for the Adobe AIR team, and I certainly hope you can do what I'd like to do. We have a highly optimized media pipeline we use to display live and playback video. It's highly configurable and adaptable. Pretty obvious given we're a company that develops digital video surveillance systems. We have our own because we need to be in charge of that pipeline. We need to know what's happening and how so we can give our users the best possible experience. The bottom line. It's critical to the success of the product. Now that we've laid the foundation for the question, here it is. How can I render into an AIR based application and not degrade performance? In a recent release of .NET 3.5 we can do this very thing in WPF, although I'd call it a bit of a hack, it works as expected, and, in general it gives us the performance we're after and makes us a nice WPF citizen. A) Describe how AIR renders. B) Describes a technique for painting on an AIR surface in a way that doesn't effect AIR performance? Now, I'm no wilting flower when it comes to rolling up my sleeves and getting dirty. If it means using some Adobe provided API's for rendering, great, point me in the right direction! My bottom line. I need to be able to render our video into an Adobe AIR application, the way I want, with the performance I expect, otherwise AIR is useless to me for this application. Thanks for any, and all, feedback. P.S. - Dear Adobe, don't take that the wrong way. I think AIR is an awesome technology. It just may not be useful for what we want to do. Thanks. Nick Hodges: "Today we announced Delphi Prism — our next generation Delphi development tool for the .Net platform. We have licensed the RemObjects Oxygene technology to create Delphi Prism. Delphi Prism is platform, stack, and database neutral. You can write code for the CLR almost anywhere it exists, including Mono for Linux and the Mac." - This happened a few days back and it represents a very interesting move on the part of the Embarcadero team. Native integration with Visual Studio will bring them a lot of attention, especially with guys like me that live in that environment and thrive in it. MSDN DevLabs: "Small Basic is a project that's aimed at bringing "fun" back to programming. By providing a small and easy to learn programming language in a friendly and inviting development environment, Small Basic makes programming a breeze. Ideal for kids and adults alike, Small Basic helps beginners take the first step into the wonderful world of programming" - BASIC has a special place in my heart. My first professional programming job was writing accounting software in BASIC, Microsoft BASIC 6.0 as a matter of fact, what a great language, it was what's referred to as Street BASIC because it was structured. So, is there any way to make XCode not default to K&R style bracing. It's just plain ugly, and quite honestly, I can't believe people still use it. When I got my first professional C job way back we didn't use it then, but it seems to have holdouts in the hacker world, namely the Unix style derivatives. Anywho, I digress, is there a way to make the braces lineup by default? Thanks! So, is anyone out there using Chyrp? It looks like it could be another nice weblogging system. Resizing a VMWare Fusion image? I need some help. I'd like to resize two VMWare images, one Windows, one Ubuntu Linux. I Googled for an answer and got quite a few hits, but I'd like some community input before continuing. Please, if you have a tool of choice for resizing a VMWare image, leave a comment or drop me a line. Steve Yegge: "I've been meaning to write up some tips on interviewing at Google for a good long time now. I keep putting it off, though, because it's going to make you mad. Probably. For some statistical definition of "you", it's very likely to upset you." - This doesn't only apply to Google. When you come for an interview at Pelco you're going to get hit with all kinds of questions; algorithms, code, games. Be prepared. Steve's post is a great starting point for any tech interview. I've been thinking about the Emacs.Net story that surfaced a few weeks back. It's beginning to make more and more sense. In the past I've used Crimson to do quick edits on everything from HTML to batch files so the idea of a quick, lightweight, editor you can hop in and out of makes complete sense. My hope for Emacs.Net is we'll get a lightweight core editor that is highly extensible, the idea of incorporating the Monad shell is nice. Emacs and Vi fit those requirements. On the PC we had a great editor at the end of the 80's called Brief from UnderWare, yes that was the name of the company. 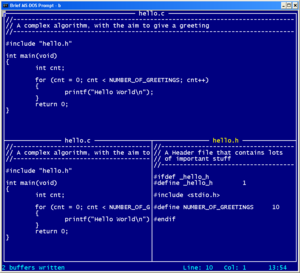 It was an all text mode editor that allowed you to load multiple buffers, split windows in multiple different directions, and was extensible in a Lisp like and later a C like language. It was, for lack of a better term, the cats meow and I used it long into my Windows development career. On the Mac I've been using Smultron and TextMate, both very good editors, super clean, quick to load, and easy to use. On Windows I've discovered Intype and e, both seem to be efforts to produce a small, quick, easy to use Windows editors. Emacs.Net should be an interesting product, hopefully it'll deliver a great experience to the end-user. Somehow, I think it will. Coda, never heard of it? Coda: "text editor + transmit + css editor + terminal + books + more = whoah. introducing coda. grow beautiful code." - This looks like a very spiffy web development tool. One for future consideration. Very cool, my post the other day lead to a great comment and a link to more talk on Emacs.Net. I've been using Microsoft based editors and debuggers for many, many, years. Can you say PWB? If you know what PWB is you're old. I remember the transition from PWB to Visual Studio 1.0. I was pleased to have a GUI based IDE but bummed because it was missing features I had with the console version of the tools. Since then I've been very happy with each release until Visual Studio 2k3 and 2k5, they're really great if you're doing C# or VB.Net, or the like, but for the C++ developer they're a bit slow at times. Don't get me wrong, even with the slowness having a great IDE blows the doors off any Linux solution I've used to date. And yes I mean C/C++ IDE's because it's what I do each and every day. As for having an Emacs.Net based editor. Ok, I guess. I can't foresee using it because I don't use emacs and don't have a use for it. It's old and arcane, but old developers get used to certain toolsets, and I can't blame them for the desire to create something they'll live in each and every day, but don't expect it to be overly successful, especially if you charge for it. On Linux I'm part of a newer crowd using KDevelop and I like it. Then again, who knows, they may create something so compelling I won't be able to resist it! If it is an IDE I be more apt to use it, I like having an integrated debugger. Oh, yeah, one other thing. I don't think Visual Studio is built as a .NET program. I think it uses .NET components but I'd be shocked if it were 100%, or even 50%, .NET. Microsoft doesn't like to throw out codebases. One more thing. I worked with a fella that went to work for the Visual Studio team at one point and hated it. It was so focused on adding features for .Net developers and fit made him sick. The money was coming in from C++ and Visual Basic Classic and they were spending tons of time writing code for the C# developer. Sven Andersson: "It seems to me that Parallels has concentrated on getting the Windows application to run smoothly and left us Linux users out in the cold. What to do? Let's try VMware Fusion instead." - Excellent tutorial for those of you, like me, using VMWare Fusion and installing Ubuntu. Now I'm using a Macintosh I have a huge desire to write applications for it. How do you get a C/C++, Win32, COM guy over to writing Objective-C for Cocoa? I may never find the time to do anything but it would be nice to have a set of references if I ever do. I've been using MarsEdit for the past few days, and I'm loving it. It connected to my Blogger based and WordPress blogs without much effort. I need to figure out how to hook it up to MSN Spaces, but I'm sure that'll be just as easy. So, if you're using a Mac, and you'd like a client side publishing tool I'd strongly recommend MarsEdit. Note to self: Check out Apple's Localization Tools. James Robertson: "I'm using XP Pro on my MacBook (under parallels), but I might install Vista at some point" - I've been using a Mac for two weeks now, and I love it. While James is using Parallels I decided to use VMWare Fusion to create virtual machines for my development use. I have a complete installation of Windows XP with all my development tools, and a machine running Ubuntu with all my development tools. I'm very pleasantly surprised with the performance, it's very acceptable, and I'm sure I could make it a bit better once I learn how to really use Fusion. Jackson Fish Market: "That’s why I think it’s OK that once in awhile we can have a small amount of healthy fantasizing about later success. For some reason, ours is never about going public, being bought, having hundreds of employees, or even changing the world (is that OK to admit?). Ours is always about office space. Specifically, it’s about where it will be located and what facilities and design elements will fill it." - Sometimes, it's all about the office space. Jackson has a very comfortable, inspiring, office space. I'd like to work in their environment every day. I started my exploration of WordPress a long time ago and really enjoyed it. I've been slow to transition for a few reasons, least of which is time, but I've been thinking about it more and more laately. I posted a couple of days back asking how it would effect what I have on my server currently and got some feedback from Prasenjeet, thanks Prasenjeet I appreciate it. The next question, and this one is SUPER important to me. I want to publish everything as static pages. I don't want to hit the database every time someone visits this site, and I don't want to have to deal with the problem Steve Rubel is trying to deal with. When I eventually switch I'll leave my old posts sitting on the Blogger servers, because I have all the content in static HTML form, archived on my site. Who knows, maybe I will back it up another way, but I don't feel the need to import it into whatever new tool I select. So, that being said, I haven't investigated WordPress thoroughly enough to know if I can publish pages in static form? Can it be done? Is it just another plug-in? Hey, I'm even open to exploring other weblogging tools, not just WordPress. 1) Cross Platform - I'm currently hosted on Dreamhost, which runs a Linux backend, and has support for all kinds of stuff. I'd like something that works on Linux and Windows, just in case I ever move hosts. 2) It must be scriptable - This is one reason I'm looking at WordPress. I'd like to do some pre-processing on my posts before publishing, so I can automagically change the header graphic based on dates, I do that manually today. Maybe silly to some, but it's important to me. 3) I'd like to install it to my server - I like being in charge of my own nightmare. While Blogger has been very, very, good to me I'd like to have more control over my publishing tool. Warts and all. 4) Must have a great community - Another reason I started with WordPress. There are lots and lots of WordPress experts out there. Thanks ahead of time for any and all help, it's much appreciated.